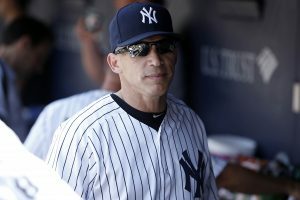 Joe Girardi, manager of the New York Yankees, wrote an essay in third grade about his dream to play baseball for the Chicago Cubs; but after the death of his mother, he almost quit baseball altogether. That is when Girardi took a leap of faith instead. Girardi grew up in a Catholic household in East Peoria, Illinois, where he attended a public elementary school before attending middle school at Sacred Heart/ Father Sweeney in Peoria, then on to Academy of our Lady/ Spalding Institute, a Catholic high school in Peoria. As a youngster, Joe was an altar boy at his church, and the family attended services faithfully. In time, Joe married his college sweetheart, Kim. He started dating her the last quarter of his senior year at Northwestern University. She was there when he needed her most, and she brought Joe into a right relationship with Jesus. They have been married over 26 years and have been blessed with three children: Serena (16), Dante (14), and Lena (9). Girardi admits that visiting players do not understand the beauty of New York. They understand they’ll be heckled all the time, and things are tough playing at Yankee Stadium. But for Joe, it turned out that going to New York really changed his life. Girardi returned to the Cubs in 2000, and he was named to play in his only All-Star game that year. 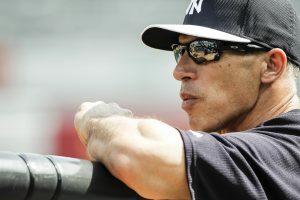 As a player, he was on the Yankee World Series teams in 1996, 1998, 1999; and, as a manager, his Yankee team won the World Series in 2009. It was a special time for Joe when he caught Dwight Gooden’s no-hitter and David Cone’s perfect game. One passion Joe and Kim have is a passion to help others. Joe has received many awards, like the March of Dimes Sportsman of the Year, Ben Epstein “Good Guy” award, community leadership award from Alzheimer’s Association, Sweetwater Clifton “City Spirit” award for aiding a stranded driver following the final game of the World Series. He collected donations at the Yankees food drive and helped assemble packets for our troops on Veterans Day. Kim has hosted events for charity that included one for stomach cancer research. Joe, I live in Peoria IL and I met your father at Aggatucci’s one Sunday evening quite some time ago. My husband was alive then and we discussed you, the Cubs and just things about baseball. I just red what Bruce Darnall wrote on interviewing you. I am very impressed. I was also raised a Catholic, St. Bernard’s elementary, Academy of our Lady, my husband went to Spalding and we met when we were 16. We were married 53 years before he passed. I think it is wonderful what you are doing. I also admire Ben Zobrist as his belief’s are similar to yours, just a different church. I am also proud of what you have done with the Yankees. Thanks for being you. Next post: What Does The Olive Tree or Olive Branch Symbolize In The Bible?